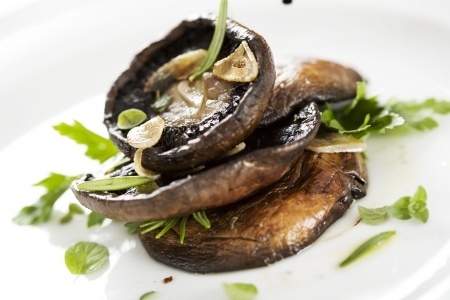 Portobello mushrooms are meaty and are great for both those who love meat and vegetarians. These mushrooms have an earthy flavor and can come in both large and small sizes. The smaller Portobello mushrooms are typically referred to as crimini mushrooms or baby bellas. The larger Portobello mushrooms are perfect for grilling and can really soak up flavor for a special treat. Whether you choose to eat Portobello burgers or add Portobellos to your steak, follow these instructions to grill them perfectly every single time. Before you begin grilling, you will want to marinate the mushrooms, if you choose. This will allow the mushrooms time to soak up the flavor. You can create any type of marinade you want or use any type that suits your taste buds. The marinade should be placed on the mushrooms once the gills are removed. At this point, before you begin any work on the mushrooms, preheat your grill so that it is ready. Your grill may take a little while to heat up so it is important that it is ready to go when you are ready to use it. If the grill is not ready when you are, you will not receive perfect grill marks on the mushrooms and the mushrooms may not cook correctly. You will want the grill to be at a medium heat. While your grill is preheating, you can begin preparing the mushrooms. Grab the package of mushrooms and open them. One thing you want to remember is to never wash the mushrooms. Even though you may be tempted to do so, you will ruin them. Mushrooms will soak up the water and become waterlogged. If there is any dirt present on the mushrooms, you will want to shake it off or brush it off with your fingers or dish towel. Now, you will begin to remove the gills from the mushroom. The gills are large and also black in color so you will not have a problem locating them. If you like the gills on the mushrooms, you can leave them, but it is often recommended to take them off. To remove these gills, grab one mushroom and turn it so that the cap is facing down and the belly side with the gills is facing up. Remove any stem that is present and then, with a spoon, scrape the gills off of the mushroom. You will want to be careful not to scrape too hard because the mushroom can and will break. To grill, place each of the mushrooms on the grill grate. Make sure each mushroom has enough room and you do not crowd them. Allow the mushrooms to cook for 5 minutes on one side. Flip the mushroom and grill for another 5 minutes. Remove the mushrooms and serve. Portobello mushrooms are great as a meal themselves or even as a side dish to the perfect steak. Grilling mushrooms is easy and it tastes much better than in the oven. You will be able to get a nice color along with grill marks. The flavor will be deep and earthy with a hint of the smoky grill flavor, talk about yum!